Synergy Theatre Project works through theatre towards the rehabilitation of prisoners, ex-prisoners and young people at risk of offending. Synergy seeks to create ground-breaking work, harnessing the energy, instincts and life experiences of those they work with, giving them a voice and, in doing so, their dignity back. Their work provides practical opportunities which builds a bridge from prison to social integration and seeks to prevent young people from entering the criminal justice system. We spoke to Esther Baker, Synergy's Artistic Director, about the history of Synergy Theatre Project and the different programmes they run. How did Synergy Theatre Project begin back in 2000? Synergy Theatre Project evolved out of work that I was already doing in prisons. I had been working in prisons for about 7 years teaching GCSEs and A Levels and putting on lots of productions. I got a Butler Trust Award for innovative and effective work with prisoners. On the back of that award, another guy who worked in prisons and I decided to set up the company on absolutely no money. We did our first production and as a result we got some funding and it evolved over time. But very much at the heart of our work was doing productions with prisoners. We developed that and worked with people when they came out of prison. We piloted different projects and different strands of the organisation developed. Tell me about some of the productions that you've put on in the past. We put on lots of productions in prisons. They tend to be of 20th century classics, so we've produced 'Glengarry Glen Ross' and 'Accidental Death of An Anarchist'. We've also produced really contemporary plays like 'Elmina's Kitchen', with an all-black cast, and 'Fallout'. 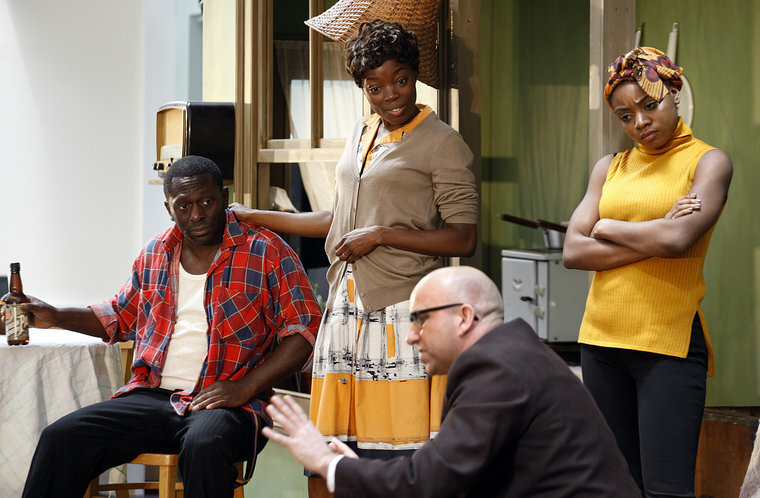 Recently, we produced 'A Raisin in the Sun' in HMP Thameside. We try not to put on plays about prison when they're in prison, because they want to escape the walls when they're in there. We always take in a team of people and we have really high production values. We spend money on transforming the space and have great sets. We rehearse over 5 weeks and then in the 6th week we perform in the prison, normally performing to a wing at a time, and then also to the prisoners' families for a separate show, as well as a couple of public performances. It's quite a powerful experience for the public to encounter theatre in that environment. We've also done lots of productions with ex-prisoners in the cast, including one American play 'Jesus Hopped the A Train' about incarceration. I'm interested in putting ideas surrounding criminal justice on mainstream stages, but they've got to be the right plays. The art is always at the centre of what we do. We also do plays for young people, looking at young people and criminality, and have ex-prisoners cast in those, which helps them to build up some skills and increase their employability. Tell me about the new writing programmes you run. We've got a new writing manager and we're really interested in putting voices from the criminal justice system on mainstream theatre stages. We run courses both in and outside prison which are led by professional playwrights. For those who show potential we'll help them to develop full-length plays. We run a national prison scriptwriting competition and in February and March we are putting on a festival of plays which came out of our latest competition at Theatre 503 in Battersea. The two plays being performed were written by ex-offenders and both of them look at the theme of addiction in different ways, one is quite serious and tragic and the other one is a dark comedy about crazy addicts. Synergy Studio is Lottery-funded, which is great. We run about ten courses a year for prisoners and ex-prisoners in acting, stage management, playwriting, film and workshop facilitation. These courses are led by mainstream experts and they give individuals the opportunity to develop theatre-based skills, as well as helping to equip them for future employment. We have some really good partners that we work with including the VA, Morley College and Sara Putt Associates. Sara Putt Associates are interested in helping to diversify the film and TV industry, so they're taking on some of our ex-prisoners to train them up for behind the scenes jobs. We find people through the studio who we then employ within Synergy, either as actors, backstage or as workshop facilitators. Tell me about the work you do with young people. We work with young people at risk of offending. We put on the plays that I mentioned earlier, but we also have a programme working with key groups that are at risk or who are already in the system. We work in Young Offenders' Institutions, Pupil Referral Units and with Looked-After Children, as well as in schools where there are higher levels of risk of young people going into prison. We do projects and workshops led by ex-prisoners working alongside professionals and it can be really effective. Synergy Services is quite a new initiative and involves using ex-prisoners as role-play actors. The main area in which we do this is probation, we train new probation officers. The ex-prisoners play the clients, and it's really useful for new probation officers to get first-hand, frontline experience. It's using the ex-prisoners life experience for a positive outcome and they also get paid for it, so it's creating employment as well. It's something we're looking to really build. Why do you think that theatre can be so transformative for both ex-offenders and wider society? Exploring a play allows you to explore different perspectives and your place in the world. We want to look at plays which the ex-prisoners connect with and which can open up an exploration of their lives. On another level, to actually end up performing in front of an audience (and doing really well – we push for high production values to give them a high quality experience) is good for confidence, it builds skills and its fun, so it's something that can give them a buzz that's legal. I also think the whole idea of working together towards something and the strong peer network that evolves is really positive as well. I think the through-care and after-care we offer really strengthens what we're doing. Additionally, by bringing the public into prisons or putting prisoners' stories on mainstream stages I think it can really challenge the public's perception. It humanises the ex-prisoners involved. Once you see them on a stage or have a conversation with them after a show you see that they are actually not that different from you and me. How do you choose which ex-offenders you work with? Are there any basic requirements? We have a recruitment process. As we've grown we recruit a lot through probation or other agencies working in the criminal justice sector. We have found that we've had more people coming to us with more complex needs who are not appropriate for certain projects. We would get advice from probation officers and mental health workers. It is actually something that we're looking at developing and we're getting a bit more training on it as safeguarding is crucial however you don't want to stop people reintegrating into society. What have ex-offenders who have worked with you gone on to do employment-wise? We've got an ex-prisoner working in the office for us. Lots of them end up doing workshop facilitation. We've had people go to work on films as set painters and things like that and others who have gone on to work backstage at The National. We've also got one guy who is at RADA who is about to graduate. We're not really trying to encourage people to go on to become actors because it's such an unstable career, but if they're brilliant we might encourage them. Some people move on to office jobs. So it's a variety. We measure our success in different ways. We take baseline assessments of individuals, assessing variables such as skills, attitudes, and aspirations, as well as taking into account their criminal history. At the end of a project we see how far people had come. If the person we're working with is in prison we'd talk to staff as an element of measuring progress. Additionally, if we're working with young people in a Pupil Referral Unit for example, we'd see if their grades had been affected by the work we'd done. We've got this snazzy database now which tracks how long people stay out of prison, if anyone goes back into prison, who goes on to do what, education and employment, etc. So we track lots of different things. Have you had feedback from employers who have taken on the ex-offenders you've worked with? Yeah, sometimes, if they think people are great. Employers love it when I send them people who are good communicators. We've had great feedback about Debbie, who is in one of our impact videos on our website. For the role-play training we are told by clients that it's the most amazing training they've had because of the authenticity, and it's fantastic that the life experiences of the individuals with whom we work are becoming strengths rather than weaknesses. But to be honest if we were referring people, we'd send people that are ready. It takes time for people to be ready for the professional world if they've never worked before. The winners of Synergy's national prison scriptwriting competition, 'Glory Whispers' by Sonya Hale and 'The Monkey' by John Stanley, will premiere at Theatre503 from the 21st February to 18th March as part of Homecomings: a festival of new plays by prisoners and ex-prisoners about getting out and going home.